Tonight, as CC Sabathia takes the mound in Yankee Stadium for Game One of the Fall Classic, baseball celebrates its signature event. The World Series is the culmination of an entire summer, as the field of clubs has been whittled down to the best in each league, facing off in a possible seven games to determine baseball's World Champion. The name "World Series" has been borrowed and applied (or mis-applied, depending on your perspective) to competitive events from auto racing to poker to cricket to, of all things, beer pong. All wanting to borrow a little of baseball's grandeur for themselves. One of the truly worthy namesakes was the Little World Series, founded only a year after Boston's American League squad upset the Pittsburgh Pirates in the first postseason meeting of the American and National Leagues. The minor league championship featured the pennant-winners from the American Association and International League, then the two strongest minor leagues. The Little World Series was played off and on until 1920, when it became an annual event. With that in mind, let's take a walk through the Brews' playoff history. Milwaukee's first two AA pennants came during "off" years for the Little World Series, so other postseason contests were held to determine the championship of the minor leagues. Following the 1913 season, the Brewers played a series against the Western League champion Denver Grizzlies. The Brewers prevailed in six games. In the lower left corner is Pep Clark, player/manager of the Brews from 1904 through 1923. The interior of the paper continued this list, beginning with the "season of good baseball" from their pennant-winning Brewers. After bringing their second pennant to Milwaukee, the Brewers played a championship series against the Birmingham Barons, victors of the Southern Association. Once again, the Brewers prevailed in six and claimed the minor league baseball championship for the Cream City. Although no Milwaukee baseball fan would know it during those heady days of back-to-back championships, it would take 22 years for the Brewers to claim their next flag. The pennant won, it was on to the postseason. 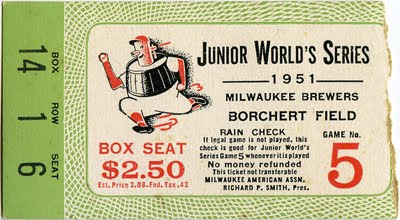 By this time, the American Association postseason series was firmly established against the winner of the International League, and had been renamed the Junior World Series (although "Little World Series" continued to be used in the press). 1936 was also the first year that the American Association inaugurated a playoff system for its Series representative, rather than simply sending the league champion. 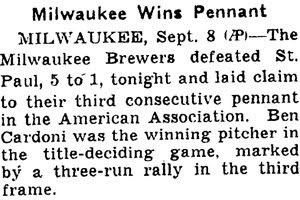 Not that a playoff stopped the Brewers - they stormed through the AA playoff and took down the International League's Buffalo Bisons in five games. This was the main objection to the Shaughnessy playoffs - it devalued the regular season standings. Under this format, the playoffs opened with the first place finisher taking on the second, and the third facing off against the fourth. All too frequently, this resulted in the top teams beating each other up and the lower-ranked teams being given an easier path to the Series. The Daily News article is also illuminating for the clear distinction it draws between the team heading to the Junior World Series and the pennant winner. The American Association pennant was awarded to the club which finished first in the standings, regardless of post-season play, at least for the half-century in which Milwaukee was represented by the Brews. This distinction has confused many modern researchers, leading some to conclude that the Brewers weren't actually American Association champions in those years. This modern revisionism couldn't be farther from the truth, as was well-documented at the time. Take, for example, this ad for Boston Store which ran in the Milwaukee Sentinel on Opening Day, April 19, 1944. The department store advertisement exhorts fans to "remember!" the Brewers' 1943 pennant (but not, presumably, that the Brewers were bounced out of the playoffs by the Columbus Red Birds). Your Milwaukee Brewers won the championship last year... remember! As the Brewer baseball season opens in Milwaukee again today, let's all pull for our home team... your team... to win the pennant again! The Brewers appeared to remember as well, taking the AA flag but losing again in the playoffs, this time to Louisville. Veeck's magnificent pennant-winners would fall in the first round of the playoffs all three years, provoking Veeck to publicly denounce the playoff format and lobby to have it scrapped. Veeck's campaign against "Shag" Shaughnessy's playoff format, although impassioned, was to be short-lived. Later that very month he sold the Brewers for a hefty profit, in favor of a return to the Majors, putting a group together to purchase the Cleveland Indians. Veeck would go on to buy (and sell) the Indians, St. Louis Browns and Chicago White Sox (twice). If Milwaukee fans were concerned that the Brews would return to their losing ways without Sport Shirt Bill in charge, they wouldn't have to wait long to have their fears dispelled. Just two seasons later, the Brews, now owned by the Boston Braves, managed to finally get back over that wall. They beat the Kansas City Blues and Louisville Colonels in the AA playoffs, and took the Series from the Syracuse Chiefs in seven games. This was the only time the Brewers would benefit from the Shaughnessy playoff structure, winning the American Association playoffs without also winning the pennant (ending the season in third place behind Kansas City and Minneapolis). The Brewers finished their Milwaukee tenure with back-to-back championships. In 1951, they cruised through the playoffs to face the Montreal Royals. After losing the first game, Milwaukee came back to tie the Series at 1-1 . The ticket at the top of this article is for Game 5, held at Borchert Field on October 3, 1951. The Brewers won the game 6-0, behind the dominant 4-hit piching performance of Ernie Johnson, and never looked back. For the box score, and New York Times recap of the game, click the headline to the right. The final game of the 1951 Little World Series was a real barnburner - Montreal got off to an early start, scoring three times in the top of the 1st. By the middle of the third inning, the Royals led the Brews by 10-2. But Grimm's boys were not to be denied, and they came on strong to win 13-10 to claim the Series. This was also Charlie Grimm's first Series win - he had played on pennant winning teams with the Cubs, and managed both the Cubs and Brewers to a pennant, but had never won a Series on any level. The 1952 Brewers got off to a roaring 24-15 start defending their crown, and Charlie Grimm was rewarded with a callup - he took over the managerial reins of the Braves (when he returned to Milwaukee the following year, it would be with the big league club in tow). While Jolly Cholly was leading the Braves through their last campaign in Boston, the Brewers were managed first by Milwaukee GM Red Smith, then by Braves pitching coach Bucky Walters. Although the Brewers repeated as pennant winners that year, they would fall in the first round of the playoffs to the second-place Kansas City Blues, who would go on to represent the AA in the Little World Series. This article from the Spokane Daily Chronicle confirms the pennant win, as well as illustrating how different times were. Would a minor league managerial shift make the papers thousands miles away today? Despite objections from other sectors of the American Association, the Toledo Sox on Wednesday night will fly a championship pennant, symbolic of supremacy in the American Association. 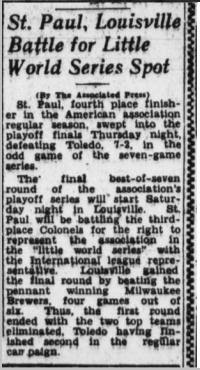 Toledo has not won an American Association title since 1927, but the current Sox players, as color-bearers for Milwaukee last year, won the flag for the second straight year and General Manager Red Smith has decided to unfurl the flannel on Wednesday night's program. The league's perspective is curious - if the Toledo franchise didn't deserve to fly the 1952 American Association pennant, who did? In the majors, trophies and honors have long followed the franchise, no matter where it happened to be located in a given year. The Blade's implication is that the AA associated the flag with the city and not the team ("Toledo has not won an American Association title since 1927"). Or perhaps that once the Brewers moved to Ohio, the AA was somehow left without a reigning champ. In any case, it is clear that the American Association championship was determined by the standings at the end of the season, and that the post-season playoff was apparently used solely to determine who would represent the AA in the Junior World Series. That might seem strange to us today, but no less so than a relocated team being asked to leave its championship behind when it moved.